"we started to play with the gravity....now it's a part of our work to master it"
"A new circus performance with juggling in the center. Isak Lindberg and Viktor Gyllenberg give you a view into their lives and of the way they bring the performance to the next level. What happens if you defy gravity? A show with flying, spinning and manipulated objects and alot of humor". Isak and Viktor are being educated at Circus Cirkör in Stockholm, sweden. They have been called "jugglers" for the last five years, and due to all circus they have been performing for a longer time. Inspired of dans, theatre and objectmanipulation they have crated somthing people call entertainment. 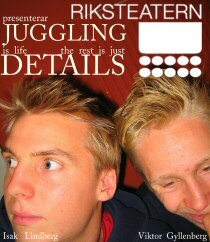 The show will be performed at Riksteatern in Hallunda 7-9 november 2003 kl. 19.00.